The third edition of Harley Quinn post-DC Comics Rebirth will be available in comic book stores from September 7 , the first chapter of the season is entitled “Die Laughing”. Harley Quinn’s latest adventure begins with her long awaited return to Coney Island, only to find that a plague of undead zombies is overrunning her neighbourhood, a full on zombie apocalypse could be on the cards! Harley, the former Batman nemesis and sometime girlfriend of Joker must protect Coney Island from the hordes of marauding zombies, while searching for the source causing the undead outbreak. In episode #3 Poison Ivy will be making an appearance to lend a hand to her long time confidant and sister-in-arms. Many DC Comics episodes have comprised the trouble-making twosome of Poison Ivy and Harley teaming up in a partnership against Batman, the Joker or sometimes both. In this story, Ivy’s knowledge of horticulture and toxins may just become very convenient. This series is being scripted by Amanda Conner (Power Girl and Before Watchmen) and Jimmy Palmiotti (Daredevil and Punisher), with illustrations in the first three episodes by Chad Hardin. The cover art for the Die Laughing chapter is designed by Amanda Conner and Bill Sienkiewicz. This new Rebirth series sequential takes place following the conclusion of New 52. As you may recall that earlier series recast Harley Quinn as an anti-hero, in this transformation she formed an alliance with Poison Ivy to recruit other strong women in fighting crime. In the finale storyline arc, her aeroplane crash landed on the shores of a remote and deserted island. The inhabiting tribe believed that Harley Quinn was a goddess, which sounded OK until she found out about the human sacrifice part! 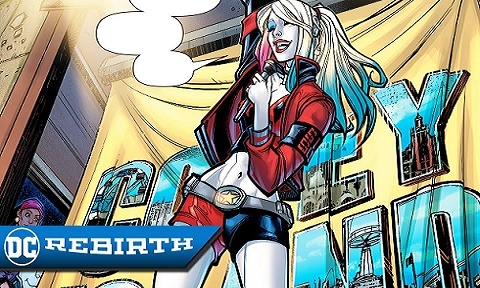 The new series continues the modern trend of depicting Harley as not totally maniacal, but more of an anti-hero. Don’t miss this new series from DC Comics. If you are a devoted admirer of Harley Quinn and want to read more about her adventures, the series Harley’s Little Black Book featuring several alternate reality episodes is presently running, with the fourth issue soon to be in print. Harley Quinn Die Laughing Issue #2 was published on August 17th. Harley Quinn Die Laughing’ Issue #3 will be published on September 7th.